Excuse this picture…I am definitely not bringing my a-game in the photo department this week. Size of Baby: According to Baby Center, about the size of a honeydew melon…about 5 pounds and around 18 inches long! Stretch Marks: Once again, besides my nasty belly button scar, nothing! I keep thinking I see them, but then I can’t find them again, so I figure they can’t be that bad. Movement: Baby girl has not gotten the memo that she is officially out of room in there…she’s still moving like she’s got all the room in the world. It hurts sometimes, but it’s also very cool to watch her move across my belly! And she keeps waking her dad up at night… I can sleep through it, but he can’t. Sleep: This week it’s been a little rough because the cough from you know where is back. I’ve had to take Tylenol PM a couple of nights just to get some rest. And it’s getting VERY difficult to change positions in bed! What I miss: A good night’s sleep (I know, it’s going to be awhile…), and NOT coughing! I don’t know if it’s pregnancy related or not, but it’s just SO annoying. 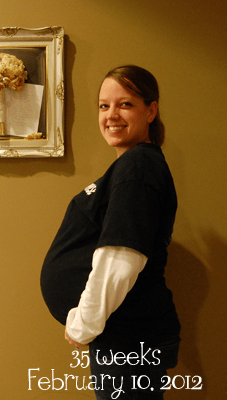 What I am looking forward to: I am so close to being DONE with maternity plans for school! I’ve got my to-do list that is dwindling quickly. I’m ready to have everything finished! Cravings/Aversions: Just incredibly thirsty still! I’m not really hungry these days…I’ve made myself eat a few meals as a matter of fact. There’s just no room for food right now! Symptoms: Still Braxton Hicks (I get a few more of those stronger ones every week). But they’ve done almost nothing! I went to the doctor yesterday…not dilated at all and just barely effaced. So it looks like we might hold out a few weeks! Insomnia, this AWFUL cough that I can’t get rid of, stuffy nose, a little bit of swelling…not as bad as last week though! Best Moment This Week: Hearing that there wasn’t much progress towards labor…that’s such a good thing right now! Keep baking a few more weeks little girl!